MANILA, Philippines – A day after the 30th anniversary of the EDSA People Power Revolution that ousted his father, Senator Ferdinand “Bongbong” Marcos Jr, said he does not want to see another episode of military rule in the country. Marcos was out of the public eye on Thursday, February 25, when the nation commemorated the the 1986 bloodless revolution that unseated dictator Ferdinand Marcos. During a program at the EDSA Shrine, President Benigno Aquino III said that if Marcos Jr is unapologetic for the atrocities committed during martial, then there is danger of him repeating them. 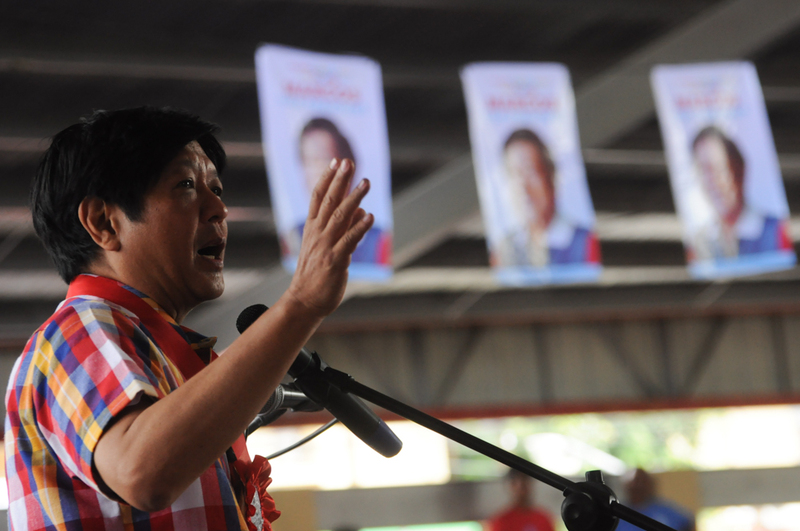 On Friday, February 26 – the 4th time Marcos visited vote-rich Pangasinan since the campaign started – reporters pressed the vice presidential candidate on whether he sees martial law happening again in the Philippines. “Oh, God, no. If there is martial law, it means we are in crisis. We don’t want the Philippines to be in crisis,” Marcos said. Marcos previously dismissed the idea of issuing an apology to victims of human rights abuses during martial law. He had said that the country benefitted from the projects his parents initiated in their 20 years in power. Marcos also addressed fears on the repercussions of their family’s return to power, which was highlighted by President Benigno Aquino III in his speech during the EDSA anniversary celebration on Thursday. “Ano namang ikakatakot dito sa amin eh mabait naman tayong lahat. Wala naman tayong ginagawa na may sinasaktan, na may ganyang klaseng pangyayari,” he defended. Human rights watchdog Amnesty International has estimated that 70,000 people were imprisoned, 34,000 tortured, and 3,240 killed during the time of Marcos’ father. A coalition of martial law victims, composed of at least 800 people from across the country, has vowed to counter Marcos Jr’s vice presidential bid to prevent the Marcoses from returning to Malacañang. 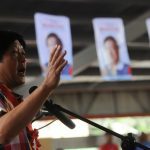 A survey front runner in the vice presidential race, Marcos was also asked on Friday whether he would abolish the Presidential Commission on Good Government (PCGG) should he be elected into office. The PCGG was created by President Corazon Aquino in 1986 to seize the alleged ill-gotten wealth of the Marcoses. “Not necessarily but, again, let’s not do selective justice,” he told reporters. Marcos previously criticized the commission’s intensified search for their alleged remaining illegally acquired properties as “politicking” now that he is running for a top post. “Huwag lang isang pamilya ang hinahabol (Don’t just run after one family). PCGG was established for good government,” he said. PCGG launched a website in February to aid their search for the high-valued paintings owned by the Marcoses. It also announced its plans to auction off the jewelries of former First lady Imelda Marcos. In a two-part series, Rappler explores the government policies and PCGG compromises that have prolonged the recovery of the Marcoses’ alleged ill-gotten wealth.